Emory writes to an unnamed doctor, asking for letter of recommendation to Secretary of State William H. Seward for a consular position. 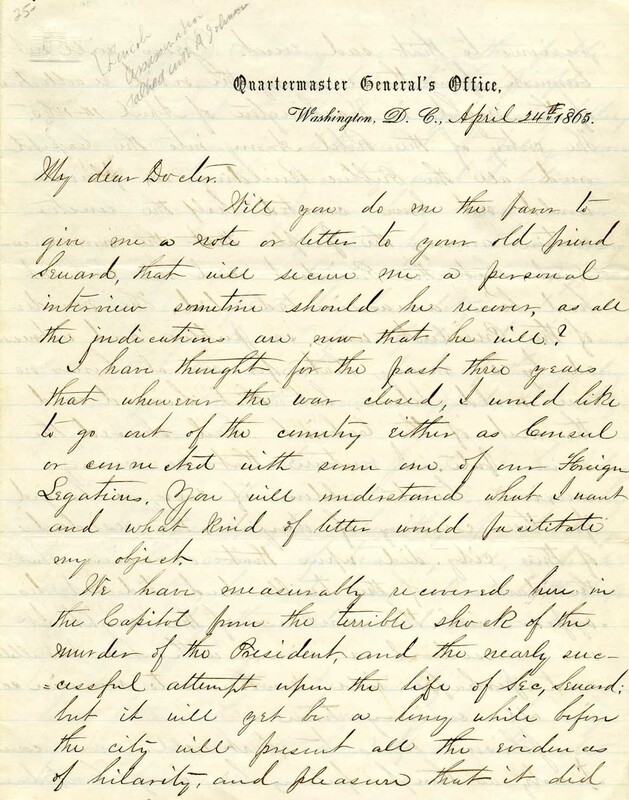 In his letter, Emory discusses the assassination of Abraham Lincoln, the public mood in Washington, D.C., as well as the actions of President Andrew Johnson. Washington, D. C., April 24th 1865. Will you do me the favor to give me a note or letter to your old friend Seward, that will secure me a personal interview sometime should he recover, as all the indications are now that he will? I have thought for the past three years that whenever the war closed, I would like to go out of the country either as Consul or can we elect with some one of our Foreign Legations. You will understand what I want and what kind of letter would facilitate my object. We have measurably recovered here in the Capitol from the terrible shock of the murder of the President, and the nearly successful attempt upon the life of Sec, Seward: but it will yet be a long while before the city will present all the evidences of hilarity, and pleasure that it did previous to that sad event. News will not banish from the memory the vivid recollectiv of the night in Washington of April 14. 1865. The entry of the Rebel Army into the Capitol and all the Public Buildings in flames would not have created half the consternation among the people that the announcement that the President and his Cabinet had been assassinated did. The murder of the President was so public and witnessed by so many, that for several hours no one would believe, but that Seward and the rest of the Cabinet had shared the same fate. I venture that so many anxious hearts seldom if ever, so longed for the coming of day as the residents of this city did upon that occasion. But the darkness of the terrible deed did not disappear with the darkness of the night. It was considered a crime without a parallell and perhaps will continue to remain so, in all coming time. Johnson seems to start well. moves cautiously as though feeling his way. Confidence in him is increasing among the public men of the government and the people generally and the cloud is gradually lifting I think Johnson is determined to fully recover himself with the country and I believe he will succeed. I saw him and conversed with him half an hour the evening of the day upon which he was inaugurated. 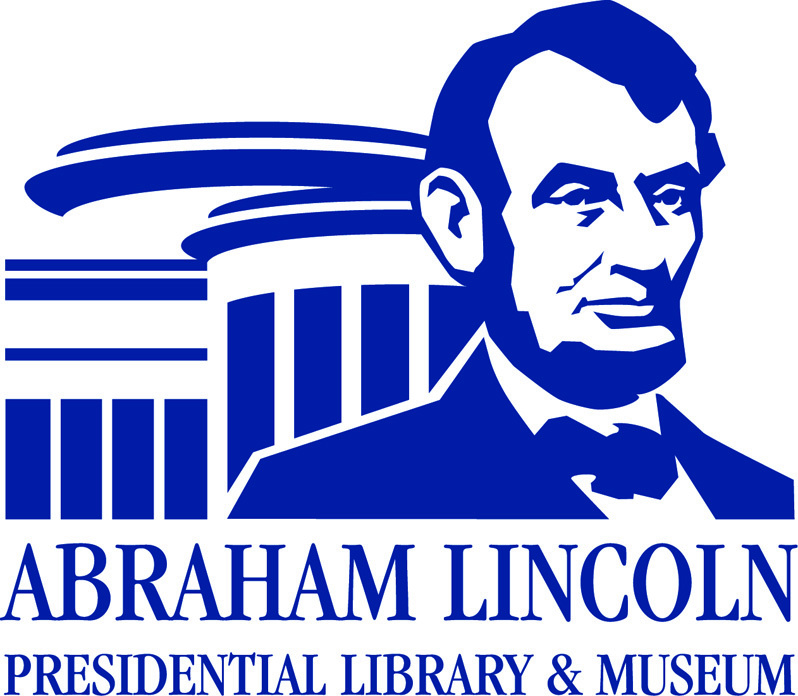 I liked his spirit, his humility, and above all his dependence upon God and his earnest desire that the Christian part of the country would give him the same support, that they gave Mr Lincoln. There is at least one point in his policy that is more than indicated. this country will be made exceedingly unhealthy for leading traitors. The crime of treason, will, under his administration, be much more odious to the people of this country than it would under Mr Lincolns policy. But I am unintentionally writing a long letter. Can I serve you any way, in any capacity here? If so, intimate to me how. I have seen two notices of your last Book, in the Adwente, but the Book I have not seen, the excitement here has been so intense and constant for a month past that nearly everthing else has been overlooked. What can I do in regard to it? If any of your Copperhead friends are in a speculating mood I advise you to sell if they will give the face of the Bonds, The Coupons on one as you see was already signed.